The “sinister name” Malombra has a long story in European culture. 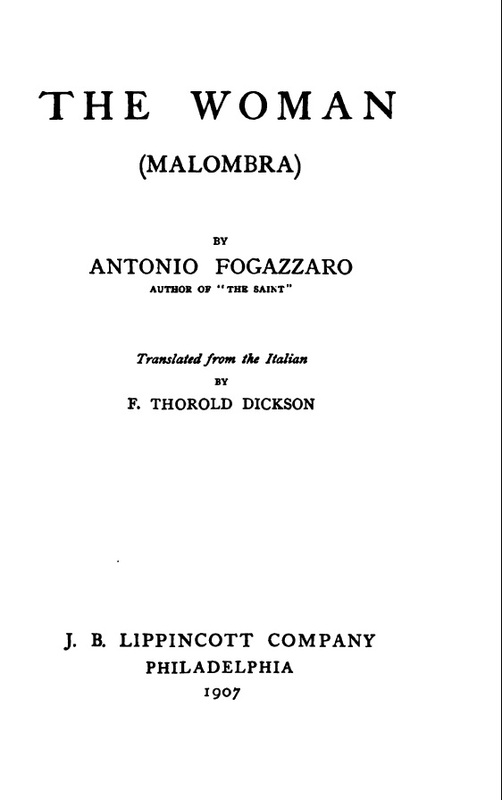 In 1881, Antonio Fogazzaro published the novel Malombra. As a recent article points out, the novel is “a perhaps unique example of an Italian novel of the period whose inspiration comes primarily from the English Victorian novel and the late gothic”. References in other texts by Fogazzaro include authors like Horace Walpole, Ann Radcliffe, Wilkie Collins, Edgar Allan Poe and books like Jane Eyre by Charlotte Bronte. Malombra was a success and was soon translated into English and published also in the UK (1896) and the US (1907). In 1942, Mario Soldati’s movie Malombra was released (after a first adaptation in 1917, made by Carmine Gallone). 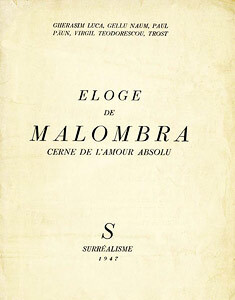 In 1947, the Romanian Surrealist Group (Gherasim Luca, Gellu Naum, Paul Păun, Virgil Teodorescu, Trost) published the collective text written in French, Eloge de Malombra – Cerne de l’amour absolu (Malombra, aura of absolute love), inspired by the film – as they called it: “the involuntarily surrealist film Malombra”. The story could go on with two more Italian films called Malombra (1974, 1984), but let’s stop here and consider instead the reasons of the surrealists’ fascination with the movie. There are no direct references within the text about why this film seemed so important for the Romanian authors – there are some hints though about their possible reasons. The title itself speaks about “amour absolu”, which leads us to Breton’s concept of ‘mad love’. The second line of the text also includes a term (“la convulsion de la beauté”) which highlights the links of the text to those of Breton. Breton promoted himself the British gothic during those years. His most explicit text in this sense is perhaps Limites non frontières du surréalisme (Limits not frontiers of surrealism), written in 1938 and published later on also in his volume La clé des champs (1967). Challenging the validity of concepts like “socialist realism”, Breton argues here that the most important task for the art of an epoch is to express its “latent content” rather than its “manifest content”. The key to this content, says Breton, is the fantastic, because of the profound emotions that can emerge from it and that cannot be projected into the real world. The genre that exemplifies this best is, continues Breton, the English novel of the late 18th century, “le roman noir” – that is, the gothic novel. Breton exemplifies mainly through the same authors as the favourites of Fogazzaro a few decades earlier, and he also highlights the fact that many French and British authors of the 19th century like Victor Hugo, Balzac, Baudelaire, Lautréamont, or earlier on Byron himself shared this interest. We can conclude that for Breton the gothic is important 1. because of its great potential to appeal to the deepest emotions and thus to become the foundation of a “collective myth”; 2. it deals with the unsolved problems of the past (the phantoms here get an evident psychoanalytical key of interpretation); 3. its archetypal setting within a “castle” which renders specific images and movements of characters to the confrontation with the past. It is interesting to note also the fact that Breton contextualizes the fascination for the “marvelous” also in a historical sense, noting that authors like Rimbaud or Lautréamont adopted this specific attitude around the year 1870 – in the immediate neighbourhood of the French–German war and of the “proletarian revolution” in Paris. The late thirties and the war years may seem quite similar to the situation that Breton evoked. The terms used by the Romanian surrealists in their text also stress on some of these aspects: “the feebleness of memory”, “the future of the past”, the ruins, “determinisms, errors and origins”, remembrance and so on. The technique of the text is based upon free association: on some scenes and settings of the film, or sometimes even on direct quotations from dialogues – that are recontextualized, of course, in the surrealist text that has elements of poetry, of rhetorical discourse, of essays, of aphorisms. The surrealist perspective shatters the narrative of the movie, and some of the scenes and dialogues gain a greater importance, even a grotesque element that emerges from a symbolic (over)interpretation of the dialogues. “Do you remember everything? Everything. I don’t remember a thing. But I know that moment had to come, Cecilia. What a world you lived in. I’m suffocating. The lake can only be seen from the left wing of the chateau.” The quotations from the dialogues are assembled here in a more or less aleatory way, or, to be more precise, as a collage of dialogues. But this shows in fact that the dialogues between Marina di Malombra and Corrado Silla in the movie are themselves absurd – their words do not meet at all, they belong to different worlds. This (the aspect of the language in some scenes of the film) is perhaps one of the reasons why Luca and his comrades called the movie “involuntarily surrealist”. Other aspects are connected of course to the images of the film. Marina di Malombra comes in the first shots of the film to live with his uncle in a castle near a lake. It is an isolated place that can be reached only by boat, through the lake. It is here that Marina discovers a family secret from the previous generation – that Cecilia, the count’s father’s first wife, was segregated in the castle, ill-treated by her jealous husband, and consequently she died. Marina becomes obsessed with the idea that she is a reincarnation of Cecilia and that she has to take revenge just as Cecilia’s letter that she finds suggests. The images that precede this discovery stress on the isolation (woman alone in a room, playing the piano, with the rain pouring outside) – suggesting that the most important events are those of the inner world. It is a crucial moment as far as the identification of Marina is concerned – at first, we only see her reflection in the “mirror” of the window: she will gain a new personality by the end of the scene. 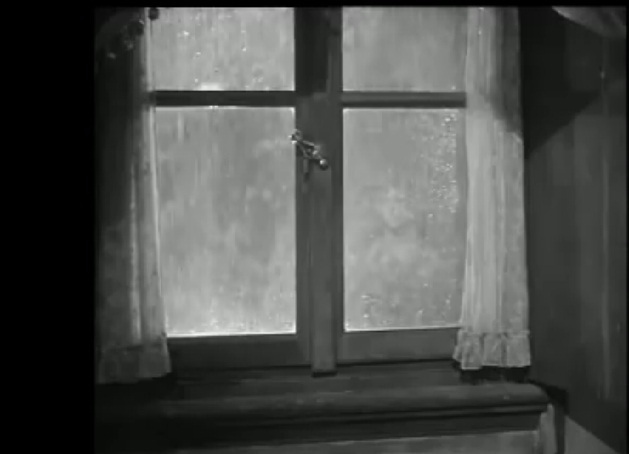 “Gothic” settings of the movie must have inspired also the surrealist authors – the “haunted” room of Marina, the uncle’s library where he speaks about books as if they were human, the stormy lake, the mysterious cave in a gorge that can be accessed just by boat are such places that (as Breton pointed out) carry meanings of the past and initiate certain types of action. The above mentioned interpretation of Fogazzaro’s novel points out that “there is no living human agency behind the events” in the plot and a strong sense of predestination can be felt. It is true also in the case of the 1942 movie by Mario Soldati. The “presence of the past” is felt strongly: there is something unsolved in the air. The surrealists do not solve the problem themselves – they just try to find more precise (and more paradoxical) names for it: “lucid hysteria”, “consciousness become foreign to itself”, “sleepy waterfall”, “somnambulism of thought”, “encounter in the present of the past”, “Malombra, mal d’ombre”. Ann Hallamore Caesar, Sensation, Seduction, and the Supernatural: Fogazzaro’s Malombra. In The Italian Gothic and Fantastic: Encounters and Rewritings of Narrative Traditions, Ed. Francesca Billiani & Gigliola Sulis, Fairleigh Dickinson University Press, Madison, New Jersey, 2007. 100. Ann Hallamore Caesar, Ibid., 102.